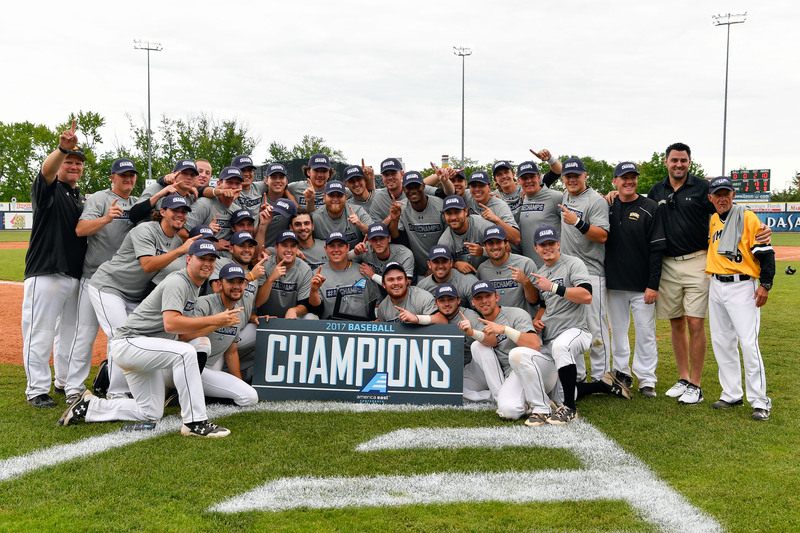 For the first time in program history, UMBC Baseball has won the America East championship and received an automatic bid to the Winston-Salem Regional for the NCAA tournament. 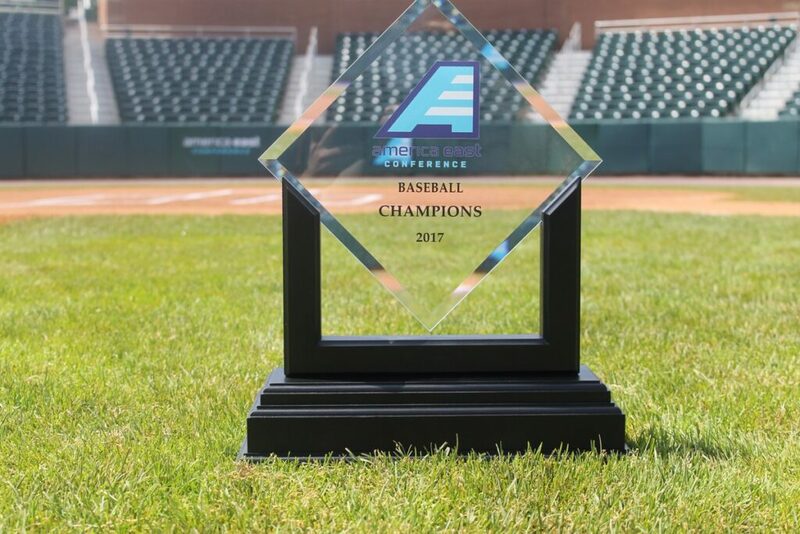 UMBC Baseball wins 2017 America East championship. Photo courtesy of America East. The second-seeded Retrievers won the America East title with a 2-1 victory over Maine on Sunday, after designated hitter Zach Bright ‘18, engineering and financial economics, drew a two-out, bases-loaded walk in the bottom of the tenth inning to push shortstop Mitchell Carroll ‘18, media and communication studies, across with the game-winning run. America East baseball championship trophy. Photo courtesy of UMBC Athletics. The team also defeated Stony Brook, 3-2, and Albany, 9-0, in the same weekend, on their path to capture the title. Following a victorious weekend, catcher Hunter Dolshun ‘17, health administration and policy, was named America East Tournament Most Valuable Player. Pitcher Matt Chanin ‘18, business technology administration; hurler Connor Staskey ‘17, psychology; outfielder Andrew Casali ‘17, economics; and Dolshun were named to the all-tournament team. On their path to victory, the Retrievers also took time to celebrate graduating seniors with a special team commencement ceremony on the road. 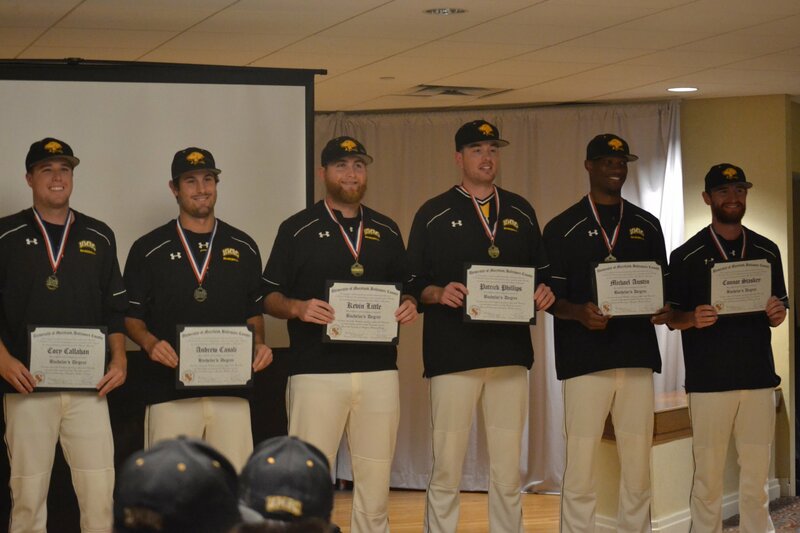 UMBC Baseball team honors graduating seniors on the road. Photo courtesy of UMBC Athletics. 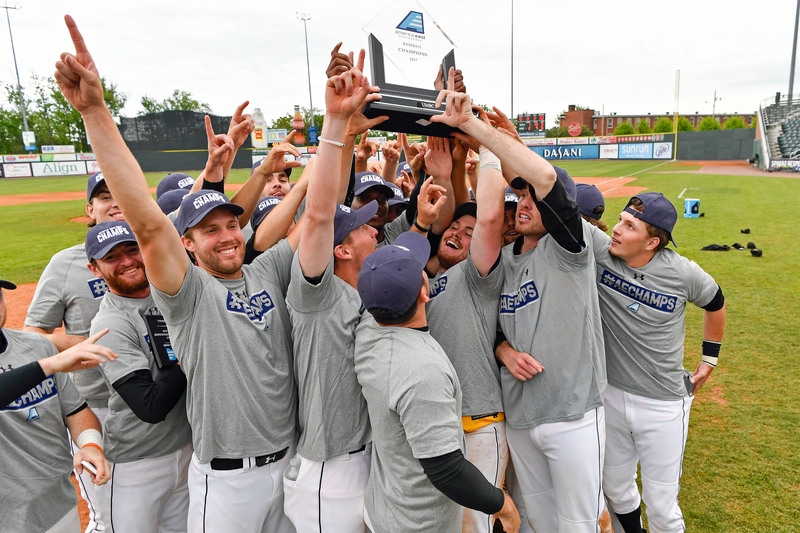 While this is the team’s first time representing America East in the NCAA Tournament, over the course of 14 league campaigns, it’s the third time in UMBC Baseball’s 31-year NCAA DI history that it will head to the NCAA tournament. Previous appearances were in 1992 (East Coast Conference, at-large bid) and 2001 (Northeast Conference title). Retrievers celebrate winning the 2017 America East baseball championship. Photo courtesy of America East. The team gathered on Monday, May 29, to hear a live ESPN2 broadcast announcing 2017 NCAA baseball tournament selection. After the University of Maryland, College Park, and West Virginia open the regional tournament on Friday, June, 2, with a 2 p.m. contest, the Retrievers will take on host Wake Forest on Friday, June 2 at David F. Couch Ballpark, with the first pitch slated for 7 p.m. (tickets available online). 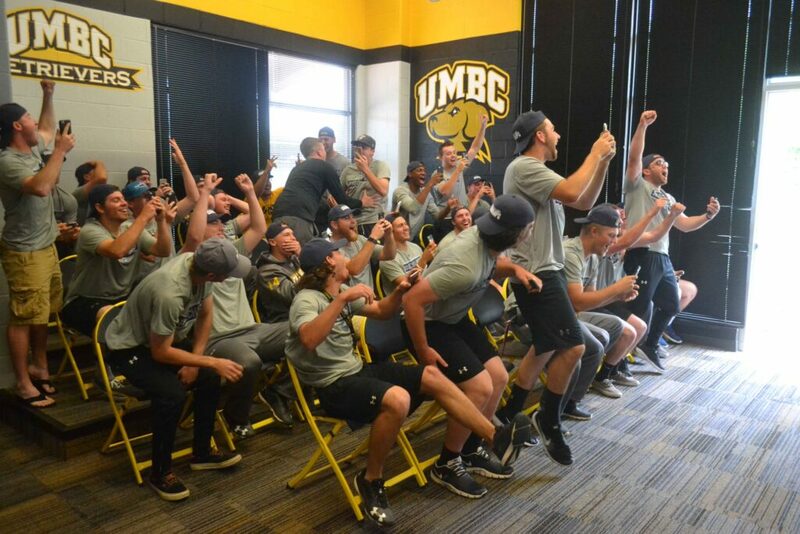 UMBC Baseball team reacts to news of their place in the NCAA tournament bracket. Photo courtesy of UMBC Athletics. The format for the regional round is a four-team, double-elimination style. The winner will head to a best of three Super Regional the following week. Retriever fans can tune in to ESPN3 for game broadcasts, and can wish the team good luck in person on May 31 at 11 a.m., at the campus welcome circle near the Administration Building, as they board the bus for North Carolina. Coverage of the Retriever’s America East victory and path to the NCAA tournament is available through the Baltimore Sun. Header image: Retrievers celebrate winning the America East baseball championship. Photo courtesy of America East.